Pen and brown ink and wash, with white opaque watercolor, on light brown toned paper. Purchased by J. Pierpont Morgan (1837-1913) in 1910. Inscribed at lower left, in black chalk, "Parmegianino"; on verso of lining, along right edge, in pen and brown ink, illegible because cropped by edge of paper; at lower left, in graphite "uu / 50"; at left center, in graphite, "No 8 /o/". Sir John Charles Robinson (1824-1913), Edinburgh and London; his sale, London, Christie, Manson & Woods, 13 May 1902, lot 252 "Parmigiano (sic) PAPAL ARMS-bistre, heightened with white; bought by Houie for £8.0.0); Charles Fairfax Murray (1849-1919), London and Florence; from whom purchased through Galerie Alexandre Imbert, Rome, in 1909 by Pierpont Morgan (1837-1913), New York (no mark; see Lugt 1509); his son, J. P. Morgan, Jr. (1867-1943), New York. The election to the papacy as Julius III on 7 February 1550 of Cardinal Giovanni Maria del Monte, who had been papal legate to Bologna since 1547, was cause for celebration in that city. The coat of arms was likely painted for the occasion. A complex allegorical fresco of the pope’s horoscope devised by the Bolognese humanist Giovanni Andrea Bianchi, called Albio, is recorded as having been commissioned by the city for the facade of casa dei Carbonesi in via Mamolo (now via d’Azeglio), close to the church of San Giacomo dei Carbonesi.3 The fresco is known through two drawings preserved in the Louvre, one a design for the complete composition, the other for a female allegory.4 Also drawn in pen and ink and wash, and in the case of the figure study similarly heightened with white, the Louvre drawings feature equally graceful figures as the Morgan study. In comparison, however, the present sheet is highly finished and much more refined. Indeed, this drawing may well have been what the artist presented to the commissioners to win the double fresco project. The Morgan drawing must have been valued and remained an object of interest. 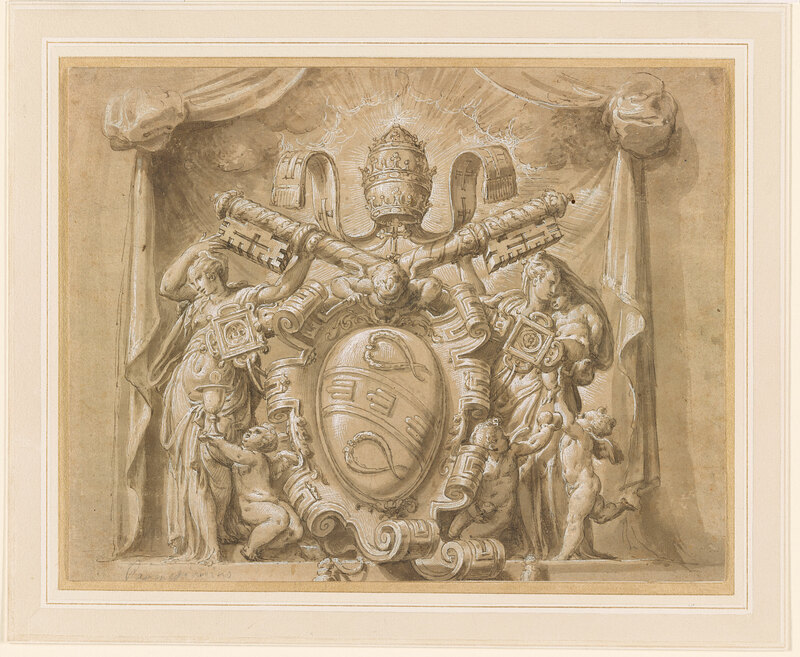 It served as the basis for a subsequent drawing that was then engraved by Giulio Bonasone in 1555 as part of Achille Bocchi’s Symbolicarum Quaestionum.5 As first noticed by Wanda Bergamini, a drawing of the Arms of Pope Julius III del Monte by Giorgio Vasari in the British Museum, probably made for a projected but never realized villa for Julius III on Monte Sansavino, is surprisingly similar in technique and composition to Niccolò’s drawing at the Morgan.6 The allegorical figures in Vasari’s study differ, however, as they are likely Justice and Religion. Moreover, the resemblance between the drawings is probably more due to a common subject than any inherent relationship, for Vasari was in Rome, and Niccolò in Bologna, at the time the drawings were executed. Zanotti laments the change to the new arms in his 1756 publication, 14. Béguin 1956, passim, and Fortunati 1995. Musée du Louvre, Paris, inv. 5845 (the drawing depicts the entire fresco); see Bologna 1969, no. 40. Musée du Louvre, Paris, inv. 5844 (the drawing depicts only a detail of a single figure); see Paris 1967, no. 1, and Bologna 2002, no. 62. For the print, see Lugli 1979, 90; Rolet 2015, 1:594. The preparatory drawing was sold at Sotheby’s, London, 13 July 1972, lot 23, no. 83. British Museum, London, inv. t,12.7; see Härb 2015, no. 202. Bergamini suggests that the Vasari drawing may have served as a model;see Fortunati Pietrantonio 1986, 283. Rhoda Eitel-Porter and and John Marciari, Italian Renaissance Drawings at the Morgan Library & Museum, New York, 2019, no. 86. Selected references: Fairfax Murray 1905-12, 1: no. 50b; New York 1965-66, no. 108; Paris 1967, under no. 1; Bologna 1969, under no. 39 and no. 40; Lugli 1979, 95n20; Ottawa 1982, no. 8; Washington and Parma 1984, no. 79; Bergamini 1986, 283, 312; Fortunati 1995, 158, 160; Bologna 2002, under no. 62; Modena 2005, no. 123; Rolet 2015, 2:856-61. Stampfle, Felice, and Jacob Bean. Drawings from New York collections. I: The Italian Renaissance. New York : Metropolitan Museum of Art : Pierpont Morgan Library, 1965. Watermark: barely visible due to thickness of backing sheet (an unclear figure in a circle). Acquired as School of Parmigianino: Girolamo Francesco Maria Mazzola, called Il Parmigianino. Parma 1503-1540 Casalmaggiore. Drawing served as the basis for an engraving by Giulio Bonasone (Lugli, 1979).